Ideal for recording up to two hours of DVD-quality home movies and video clips. Archive and backup, up to 4.7 GB of important data. Note: A minimum quantity of 104 must be ordered, and in units of 8 thereafter. 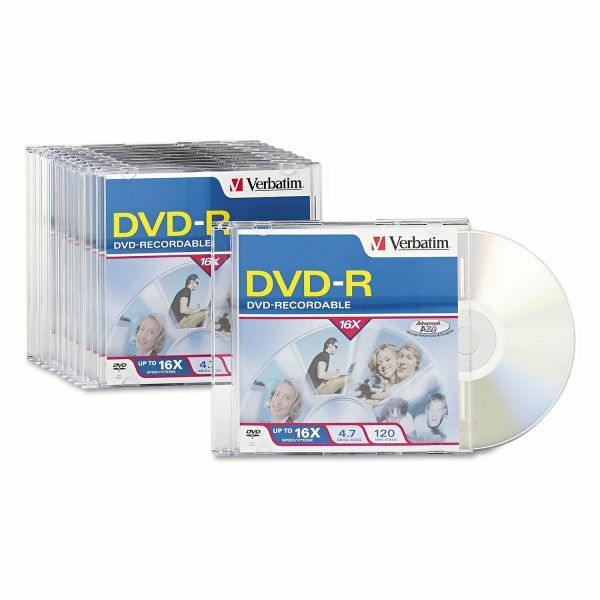 Verbatim DVD-R Discs, 4.7GB, 16x, w/Slim Jewel Cases, 10/Pack - DVD-R offers 4.7GB or two hours of write-once storage capacity, superior recording quality, and compatibility with 1X to 16X DVD-R writers. DVD-R allows you to record, archive and back up a complete 4.7GB/120 minute disc in approximately 5 minutes. Recognized as the choice of professional users, DVD-R offers the optimal Advanced Azo recording dye, which provides the highest level of read/write performance, reliability, and archival life. DVD-R media is compatible 16X DVD-R drives. Read compatible with most DVD-ROM drives and DVD video players. The capability to write standard CD/DVD formats is drive dependent. Recorders, players and drives will play standard CD/DVD disc. Jewel case packaging includes jewel case and insert. Spindle product is packaged in a plastic container and does not include jewel cases or inserts. “Write Once” format—may not be altered once data is written to the disc.